* Welcome to the Party! 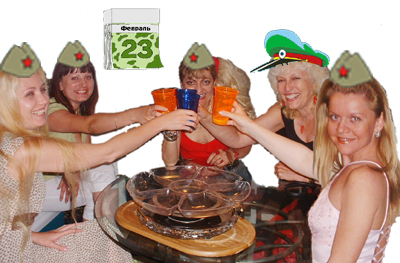 Single Russian ladies residing or visiting the USA find out about Saturday Club socials from Russian newspaper advertising and through the word of mouth.. More than 300 happy couples matched by Encounters International are the best advertising that we could have hoped for. Some single ladies are US citizens or permanent residents for many years, while others came to visit their relatives (often married to EI clients.). Also, there are exchange students, interns, business visa holders and ladies who won their US residency (green card) in lottery among those Russian/Ukrainian ladies who apply for EI membership. Some Russian women came to the USA as fiancees or wives, but the relationship did not work out. Somebody's loss becomes EI clients'gain. The most powerful insentive for these ladies to join EI is the reputation that Encounters International has for representing only established and marriage-minded gentlemen. Our ladies know that they will receive matchmaking advice. And of course, the fact that we throw monthly parties makes the everything even more attractive. Encounters International applies same high standards to Russian ladies joining EI in the USA. I personally screen and interview each lady. At present there are about 150 US based Russian women - EI members and this number is growing. Most of them are from the Greater Washington area (Washington DC, Maryland and Virginia), but there are a few who live in NYC, PA, IN, FL and CA. While some of them can not attend Saturday sociasl because of the distance, others prefer to meet men only in person at our parties to avoid displaying their pictures in the database for confidentiality reasons. Our socials are a gold mine for such ladies. "At 18 we say: "If I ever get married, it would be only for Love", at 20 we say: "I may get married without love, but for big respect", at 25 we claim: "Marriage is a must! ", at 30 we scream: "Marriage or Death". Therefore we may assume that there is no other word more pleasant for a single woman, than a word "bachelor". A bachelor is a hope for the heart and a joy for the eyes. So, let's toast the bachelors, especially those who are members or soon-to-be members of Encounters International!!!"